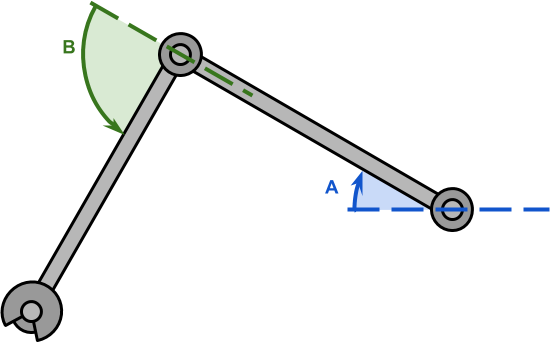 In the previous part of this series, we have discussed the problem of inverse kinematics for a robotic arm with two degrees of freedom; like the one in the diagram below. In such a scenario, the length of the robotic arms, and , is typically known. If the point we have to reach is , then the configuration becomes a triangle in which all sides are known. At a first glance, they might look rather intimidating; their geometrical interpretation, on the other hand, should be farily intuitive looking at the diagram above. The first step to implement this solution is to create a robotic arm. The concept of “joints” is not something that Unity comes with. However, the parenting system offered by the engine can be exploited to create a hierarchy of components that will behave exactly like a robotic arm. The idea is to use a GameObject for each joint, so that rotating its transform will cause the arm attached to it to rotate as well. Parenting the second joint to the first joint will cause them to rotate like seen in the first diagram. We can then add a script to the root object called SimpleIK, which will take care of rotating the joints to reach the desired target. The equations derived in the previous part of this tutorial require knowing the length of the first two bones (called and , respectively). Since the length of the bones is not supposed to change, it can be calculated in the Start function. This, however, requires the arm to be in a good configuration when the game starts. The mathematical functions and are called Mathf.Acos and Mathf.Atan2 in Unity. Also, the final angles are converted to degrees using Mathf.Rad2Deg, since the Transform component accepts degrees, instead of radians. While the code above seems to work, there is a condition in which it fails. What happens if the target is unreachable? The current implementation does not take that into account, resulting in undesirable behaviours. A common solution is to fully stretch the arm in the direction of the target. Such a behaviour is consistent with the reaching movement that we are trying to simulate. The code below detects if the target is out of reach by checking if the distance from the root is greater than that the total length of the arm. // Is the target reachable? What’s left now is to rotate the joints. This can be done accessing the localEulerAngles property of the joints’ Transform component. 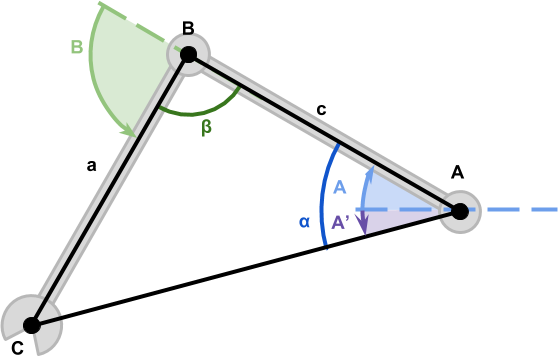 Unfortunately, it is not possible to change the z angle directly, so the vector needs to be copied, edited and replaced. 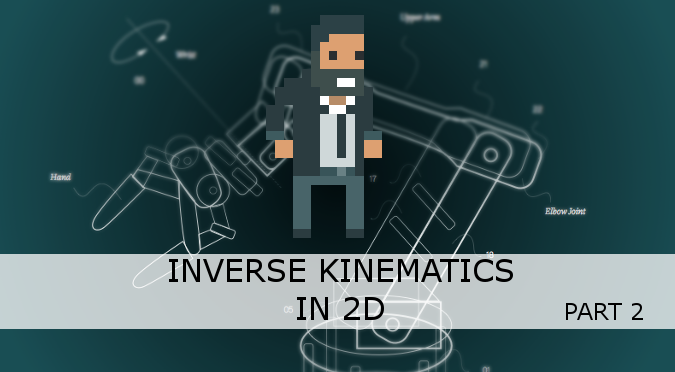 This post concludes the course on Inverse Kinematics for 2D robotics arms. The line art animals that have been featured in this tutorials have been inspired by the work of WithOneLine. You can download all the assets used in this tutorial to have a fully functional robotic arm for Unity. I’ve been wanting to add more interactive examples to my website, but is hard to find good (and simple) frameworks to use! *cough* that’s github.com/enkimute/ganja.js .. mea culpa. Would be great if you could provide a bare-minimum project sample and not assume that everyone has the funds to subscribe to Patreon. Nonetheless, your content is very helpful for someone to get the basic idea. how you drawing this line in GIF in Unity ? It’s a trail renderer attached to the end effector of the robotic arm!